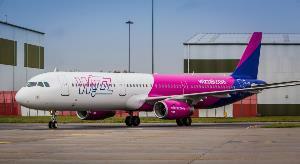 Wizz Air, is one of Europe's fastest growing airlines and continues its expansion in Israel, with the launch of two new routes, Budapest – Eilat (Ovda) and Sofia – Eilat (Ovda). These new low-fare services will start operating during November 2018, along with 5 other winter routes from Eilat: London, Vienna, Bucharest, Riga and Warsaw. The Budapest – Eilat route operates on Mondays and Fridays and starts of 9th November, with launch fares from €19.99. The Sofia – Eilat route will fly on Tuesdays and Saturdays with effect from 10th November and the launch fares for this route starts off at €19.99. Wizz Air has rapidly grown its route network from Israel since its first Tel Aviv flight in 2012, the carrier now offers 25 routes to 9 countries from Tel Aviv and Eilat airports. This year, the airline is offering 1.3 million seats in routes to and from Israel and in 2019 the company is expected to offer 1.6 million seats. From January to July 2018, approximately 640,000 passengers enjoyed Wizz Air flights to and from Israel, up 81% from the same period last year. The company continues to grow and expand its operations in Israel while supporting more than 530 indirect jobs in the field of aviation and tourism in 2017. During the upcoming winter season (2018-2019) the company is expected to support 90 indirect jobs in Eilat, thus emphasizing its commitment to Israeli tourism as a whole.